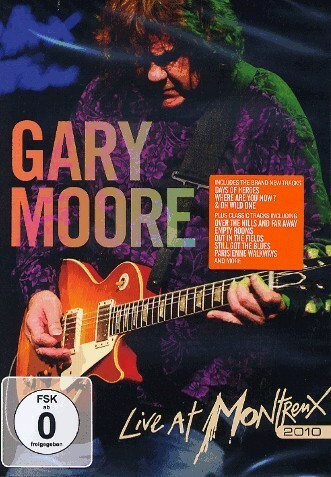 Gary Moore's last recorded performance. As everybody is aware, Gary tragically died in February, aged just 58. Back in July 2010, he and his new band of Neil Carter, bassist Jon Noyce and ex-Scars drummer Darrin Mooney played a rock set at Montreux Jazz Festival, one of Gary's favourite events. With the release of this DVD and accompanying CD, we have chance to witness Moore's last recorded performance. But it’s a disconcerting view to see such a bloated guy! Vocally, he starts off pretty well, but he soon runs out of breath meaning he cuts some notes short or doesn't attempt them. Carter, who has been teaching for years, does a credible job for his share of the vocals but there is some inevitable rust and there are some, shall we say, rather raw notes from them both. Despite that, the quality of the guitar playing is still there and the rock stuff sounds great. The terrific 'Thunder Rising' makes a welcome return, as does 'Military Man'. To add to my mixed feelings about the gig, Gary debuts some new songs and this gives us a glimpse of what might have been - and they sound pretty good. 'Days Of Heroes' is a great Celtic rocker reminiscent of material from 'After The War' and the bluesy ballad 'Where Are You Now' is also promising. The energetic 'Oh Wild One' is arguably the best of the three and Carter and Moore capture their harmonies perfectly here. The set also includes 'Blood Of Emeralds', 'Out in the Fields' and of course 'Parisienne Walkways' along with 'Still Got the Blues' and crowd pleaser 'Walking By Myself'. It's a great set that is performed pretty well and promised much; it's just hard to watch how much Gary had let himself go - a fact that is only compounded by four bonus tracks taken from his performance there in 1997, where he looks a different person. With that disturbing visual in mind which saddened me more than the great music uplifted me, I would say the CD is the better option - were it not for the fact that it inexcusably cuts 'Thunder Rising' and 'Still Got The Blues' in order to get it on one disk. Fortunately all three new tracks are present so it's still worthy of a listen. So, would I recommend it? Yeah, I think so, but it's melancholic - on the one hand, it's a last nod to Gary's great 80's rock stuff and the three new songs are very welcome, but it also rubs salt in the wound that we lost Gary Moore when he clearly still had plenty of great music left to give. I only hope that in the wake of his death the archives are plundered so we can celebrate what he did record - and I hope that old ‘Wild Frontier’ video is cleaned up and put out for an official DVD release, because that's the Gary I want to remember.